The NDT Line Plastic Tank has been designed and manufactured for a local Aerospace OEM for use within the NDT department to hold a water based emulsifier. The tank has been manufactured from PE 300 sheet, which has been formed and full welded to create a sealed, water tight tank. To provide extra support the solution features an external 50mm x 50mm mild steel frame around the centre of the container. The solution also features 2 off 25mm handles located on either side of the unit to allow the unit to be maneuvered but only when the tank is empty. In addition, the unit will feature a brass drain tap to allow the tank to be emptied when not in use. PE 300 has been chosen because of its high abrasion resistance, easily machinable and high chemical resistance. 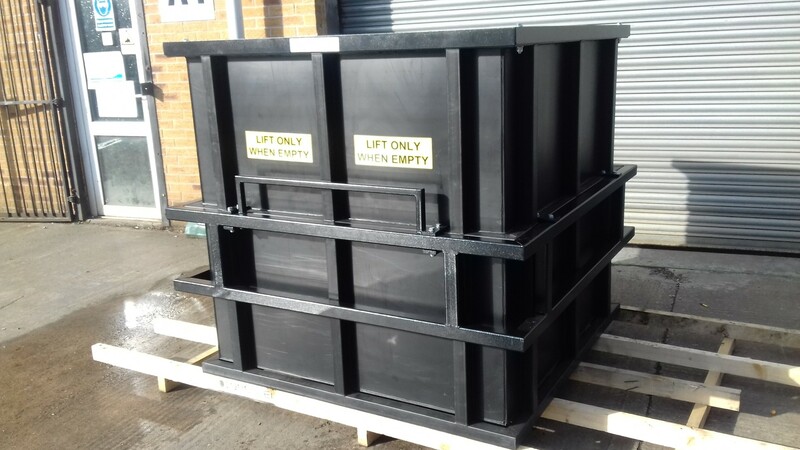 The plastic container has been left in its natural colour and the external frame has been powder coated in black to provide a hard wearing durable finish. Approximate overall Dimensions: 1300mm (W) x 1300mm (L) x 1300mm (H).